ARLINGTON, Va., Oct. 23, 2017 /PRNewswire-USNewswire/ -- USO supporters gathered at the Marriott Marquis in Washington on Oct. 19 as a Force Behind the ForcesSM to celebrate the actions of America's service members and USO volunteers from around the globe. The evening hosted by award-winning journalist Tamron Hall highlighted the nonprofit's Fueling the Future Campaign, a four-year, $500 million fundraising initiative focused on providing America's service members with the critical connections they need to stay strong and resilient. "Why do we gather together tonight? It is because we hold a common belief," said Dr. J.D. Crouch II, USO CEO and president. "We believe a strong America is a force for good in the world, and our strength as a nation rests on keeping service members connected to everything they joined the armed forces to defend – family, home and country." The Fueling the Future Campaign – one of the most ambitious fundraising efforts in USO history – gives military supporters a chance to have an enduring and meaningful impact on the lives of service members by contributing to USO center expansion and renovation, program support and global reach, transition services, innovation and growth and a quick reaction fund. Thanks to generous supporters to date, the USO has raised $60 million toward its goal to raise $500 million by 2020. 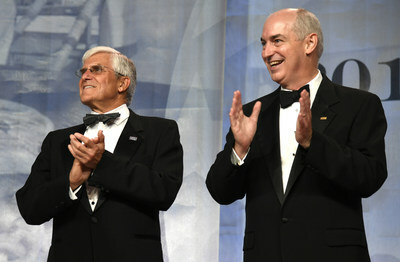 Pivotal partners in the campaign, Gala Co-Chairs The Boeing Company and The Kroger Company underscored their commitment to the USO. Boeing announced a commitment of $5 million to USO PathfinderSM – a transition program offering best-in-class services to those exiting the military – and longtime supporter Kroger was honored for their cumulative $20 million contribution to the USO since 2010, in addition to hiring more than 35,000 veterans. "As someone who sees the greatness in our veterans each day as individuals, colleagues, team members and friends, it is easy for me to share how proud we are to partner with the USO on this program and how satisfying it is to help talented individuals advance to the next step of their careers," Leanne Caret, executive vice president, The Boeing Company and president and chief executive officer of Defense, Space and Security said of the multimillion dollar commitment. Boeing's contribution will support more than 210,000 transitioning service members during the three-year investment period. A special performance by comedian Jeff Ross, "The Roastmaster General," had the ballroom howling as he roasted a few willing volunteers from the 600-person crowd. Ross, a loyal supporter of the USO, has been on six USO tours and explained how his work with the military has made a significant impact on his life. "If you can make a joke penetrate someone's vest or helmet, to me that is the biggest home run," Ross said. "Service members are always thanking me for coming on tours, but the truth is I should be thanking them, because I am a better person, a better American, a better human being because of it." 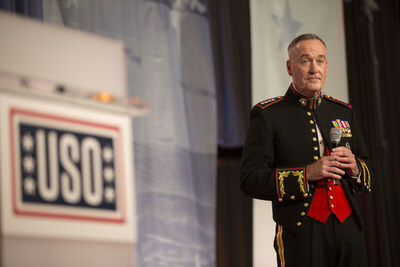 After Ross' performance, Joint Chiefs of Staff Chairman Gen. Joseph F. Dunford, Jr. delivered remarks and presented USO Service Member of the Year awards alongside retired Army Gen. George W. Casey Jr., chairman of the USO Board of Governors, senior military leaders and Crouch, the USO's CEO and president. Dunford – who traveled with Ross and Crouch on a USO holiday tour to the Middle East last year – thanked the USO for all it does to support our nation's men and women in uniform. "Our young men and women know what they do is appreciated, they are proud of what they do and they know you are proud of what they do," Dunford said. "And, I'm here to tell you, that there are a lot of organizations out there that support our military every day, but there is not another organization out there that does it any better than the USO." The evening ended with a standing ovation for all service member honorees and a warm sendoff by Tamron Hall, whose stepfather Clarence Newton Sr. spent nearly 30 years in the Army. Hall dedicated the evening to her dad and all who serve. "As someone with deep and abiding respect for our service men and women and the sacrifices they and their families make every day on behalf of our country, it's a real joy for me to share this evening with you," Hall said to the audience. "To be here with you tonight is a small but earnest gesture of my gratitude for all you do." 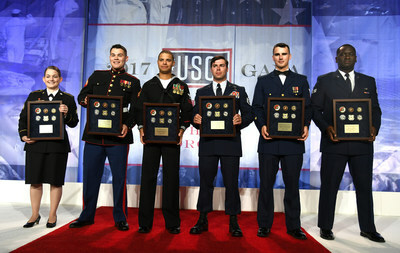 - USO Marine of the Year: Cpl. Justin C. Ahasteen, Office of Legislative Affairs (OLA), Headquarters United States Marine Corps, Washington, D.C.
- Two Star: A. James and Alice B. Clark Foundation, The American Legion, DAV (Disabled American Veterans), Eurpac Service Inc., EY, FTD Companies, Inc., Halfaker and Associates, LLC, USO of Georgia, Inc.
For more information about the 2017 USO Gala please email usopr@uso.org.